Rural apartment , keeping the tradicional arquitectural style , surrounded by fruit-tree garden.The apartment has two bedrooms, one with a double bed and the other with two beds; additional beds are also available. The kitchen-living room is completely furnitured with modern appliances ( cooker, oven, microwave, electric mixer, dishwasher, water heating……) , a sofa-bed, bathroom and terrace with spectacular views . The bedroom are spacious, with a lot of clarity and fantastic views . They are completely equipped for cur customers’ comfortableness. They are also filled with central heating, television, household equipament and linen. The apartment have also a garden with tables, chair and hammoks, big car-park and barbacue where you can meet your friends and spend an unforgettable evening by the fire. 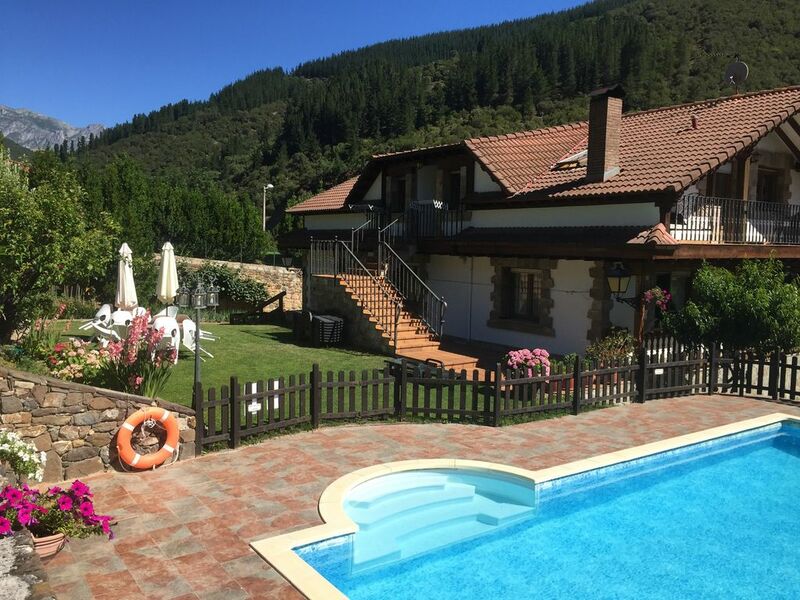 An ideal place for families, couples or groups who want to enjoy a quiet stay near the mountains at just two kms from Potes. We have internet connection too through a free wifi system only for our customers. El apartamento está fenomenal. Todo nuevo. La piscina muy limpia y la zona de la barbacoa está muy cuidada. Al ser 3 apartamentos juntos se puede juntar un grupo grande de gente. Muchas gracias Alvaro , me alegro que hayáis estado cómodos. Ha sido un placer conoceros. Un saludo. "Superbe séjour, tout est conforme à la description. Le gite est très propre, ainsi que la piscine. Les propriétaire sont très chaleureux. Très belle balade, paysage magnifique, un dépaysement complet." During your stay you will have the possibility to spend your spare time enjoying the wonders of this region, visiting the beautiful villages of the area discovering its natural and arquitectural heritage….. The Liebana valley offers its visitors different alternatives to enjoy adventure : hiking, mountain bike, rides, canyoning, paragliding……. For thosewho love adventure and sports related to nature, this place will be an ideal and true paradise.